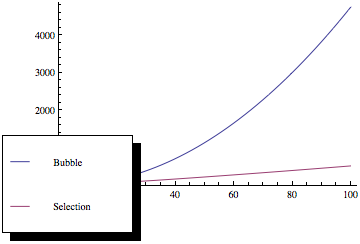 Why is selection sort faster than bubble sort? All complexities you provided are true, however they are given in Big O notation, so all additive values and constants are omitted. To answer your question we need to focus on a detailed analysis of those two algorithms. This analysis can be done by hand, or found in many books. I'll use results from Knuth's Art of Computer Programming. As you can see, bubble sort is much worse as the number of elements increases, even though both sorting methods have the same asymptotic complexity. This analysis is based on the assumption that the input is random - which might not be true all the time. However, before we start sorting we can randomly permute the input sequence (using any method) to obtain the average case. I omitted time complexity analysis because it depends on implementation, but similar methods can be used. The asymptotic cost, or $\mathcal O$-notation, describes the limiting behaviour of a function as its argument tends to infinity, i.e. its growth rate. The function itself, e.g. the number of comparisons and/or swaps, may be different for two algorithms with the same asymptotic cost, provided they grow with the same rate. More specifically, Bubble sort requires, on average, $n/4$ swaps per entry (each entry is moved element-wise from its initial position to its final position, and each swap involves two entries), while Selection sort requires only $1$ (once the minimum/maximum has been found, it is swapped once to the end of the array). In terms of the number of comparisons, Bubble sort requires $k\times n$ comparisons, where $k$ is the maximum distance between an entry's initial position and its final position, which is usually larger than $n/2$ for uniformly distributed initial values. Selection sort, however, always requires $(n-1)\times(n-2)/2$ comparisons. In summary, the asymptotic limit gives you a good feel for how the costs of an algorithm grow with respect to the input size, but says nothing about the relative performance of different algorithms within the same set. Bubble sort uses more swap times, while selection sort avoids this. When using selecting sort it swaps n times at most. but when using bubble sort, it swaps almost n*(n-1). And obviously reading time is less than writing time even in memory. The compare time and other running time can be ignored. So swap times is the critical bottleneck of the problem. Not the answer you're looking for? Browse other questions tagged algorithms runtime-analysis efficiency sorting or ask your own question. Best and worse case inputs for heap sort and quick sort? Why don't we calculate swaps and other steps except comparison for finding time complexity of a sorting algorithm? What sorting algorithm should be used for this array? Why is my own implementation of Bubble Sort so much slower than another one I found online? What is the real reason that Bubble Sort runs at O(n) in best case?